I remember clearly many of the traders in Pontypool who travelled around the town calling at the houses or yelling out their wares as they passed. I’ve already written about Watkins the tinker so I’ll say no more about him, but another trader who walked around selling her one commodity was the cockle woman. From time to time she would walk along the back lane at Wern Terrace pushing a large wheelbarrow which was full of cockles. When we heard her cry of “cockles” my mother would go down to the lane and get one or two jam jars full of cockles which she would cook as part of our meal. Another peripatetic trader was the salt and vinegar man. He had a horse and a small cart, the latter being filled with a large barrel of vinegar and a wall of huge blocks of salt which he would cut into any size you wanted. Then he would weigh it on his scales. The usual block of salt was about the size of a loaf of bread; these could also be bought wrapped in paper from the grocery shops. The block then had to be cut into smaller blocks which were usually kept in a jar. When salt was needed for the salt cellar my mother would take out a few lumps and crush them in her hands into grains. This was easily done and sometimes I was allowed to do it. The milkman, of course, called every day. Ours was Caleb Counsell who was a relative of my friend Elgar Counsell. On his van he had several huge churns of fresh milk. 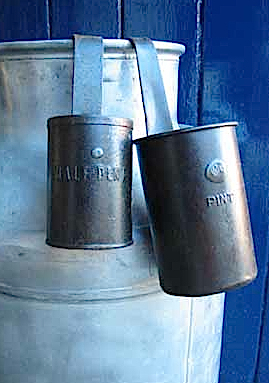 He also had a smaller churn which he kept filled from the larger ones. He called at the front door with the small church and asked my mother how much milk she wanted. My mother would hand him a large jug and say how much she required, then the milkman would use his ladle to measure it out and pour it into the jug. Using this method it was possible to buy an odd or extra half pint if you so wished. Mr Marshall, the baker was not a regular visitor at our house because my mother made her own bread – five large loaves every Friday evening. But on occasions when we ran short she would keep an eye open for the approach of his van and would buy a loaf. He usually also had several trays of fancy cakes at the back of his van so I often persuaded my mother to buy some for tea. Another trader which we saw just occasionally was Mr Brimfield with his hardware lorry. This was partly under cover as he sold carpets, rugs and oilcloth etc. He also sold paraffin and many other hardware odds and ends. A very unwelcome caller was the gypsy woman who called at the houses from time to time. She only sold a large sort of peg roughly chipped out of wood and bound at the top with a metal strip. They were generally in quantities of half a dozen. She was mostly accompanied by a few others who were calling at other houses. She always told my mother how lucky she would be if she bought some of her pegs but my mother was not impressed and generally sent her on her way. There were all sorts of old wives’ tales about the gypsy women putting curses on you if you didn’t buy her pegs. The gypsy families lived in caravans at The Race in Pontypool. They were next to a rubbish tip which always seemed to have small smelly fires burning in parts of the tip. New antiques show coming to Pontypool. Can you help? Yesterday I heard from Heather Absalom of the BBC who is organising “The Great Antiques Map of Britain”. The show will be visiting Pontypool. The three queries she raises are self explanatory so I print them below together with the second email she sent me. If any visitor is able to help with these queries please contact Heather direct. Her address, telephone number and email are at the bottom of her letter. I am contacting from a brand new BBC series called The Great Antiques Map of Britain, in which our presenter Tim Wonnacott, will be travelling all over the UK discovering the people, the places, the antiquities and the collectables that tell the story of Great Britain. We are coming to the Pontypool to talk about the Allgood Family and Pontypool Japanware and I wondered if you might be able to help me with the below queries? 1) Have you had ever been contacted by anyone that may be a descendant of the Allgood family, or had ancestors that worked in the Pontypool Japanware industry? If so, might you be able to pass my details onto them to see if they would like to get in touch with me? 2) Is there anywhere in Pontypool still connected to the industry, the old factory for example? In one article I read it mentioned that: Japanware was made below the Cross in Pontypool and soon afterwards in West Place, Crane Street, in what became known as Old Japan. Do these places still exist? Is there anything to commemorate the industry? 3) I know it’s extremely rare, but we’re also looking for someone that may have a piece of Pontypool Japanware or perhaps something that they think might be Pontypool Japanware, that they would like to find out more about. We are in touch with the museum, but also looking for a private collector that could bring the piece to show our presenter. If you could help with any of the above, I would be very grateful. Apologies, me again, I knew that I would forget something! I had a fourth query, in each place we visit we will be pulling up with our mobile ‘valuation station’ in which our presenter will be looking at and valuing items that people bring along to him. We’re looking for a village green, or square to base this and I wondered if you or any readers of your blog could suggest anywhere in Pontypool for this? Professor Alfred J. Thompson of Bristol was blind from birth and came to teach at West Mon about 1943. He was always accompanied by his wife who had to guide him everywhere. As the piano was on the hall stage, that’s where we had our music lessons with him. I remember being totally amazed the first time I saw him play the piano. I was learning the instrument at that time. He just placed his hands on the keyboard to find the keys and then he just played effortlessly and, of course, from memory. Later he wrote the school song which is featured elsewhere on this blog. Music lessons with “Toot” Steven had always been rather irregular and perfunctory but with Professor Thompson we really got down to it. He lived just a few doors down from Park Terrace Methodist Church and held music appreciation classes at his home. Eric attended these and Professor Thompson gave him 40 records and a walnut record cabinet. Miss Orella Jones was the glamour mistress at West Mon. As teenage boys we had an eye for this sort of thing and frequently talked about our mistresses’ qualities in a way which had little relation to their teaching abilities. Gilbert Garnett was frequently seen talking and laughing with Orella. I also remember Jehoida Brown – a prefect when I started at the school – when he visited the school in his army uniform earnestly chatting to her in the school hall. I suppose he would have only been about six years younger than Orella. She was leaning against the wall and Jehoida stood a couple of feet to the side with his hand leaning on the wall about a foot from the side of her head. I remember wondering what this cosy little tête-à-tête might have been about. Orella was engaged to Tom Churchill who took me for French in Six Arts (written about earlier in this blog). Unfortunately he died quite young and Orella transferred to the Girls’ County School. Eric told me that she never married which I found quite surprising. If any visitor has any recollections or photographs of either of these two members of West Mon’s staff I should be pleased to hear from them. A man who got married in Pontypool in 1945 later committed bigamy in 1949. Whilst staying in a hotel with his bigamous wife, he seemed to have run out of cash, so telegraphed his first wife and asked her to pay the hotel bill. Now how’s that for real cool cheek ??? Brynley George Davies, a 26-year-old freelance surveyor, formerly of Oakleigh Park Drive, Leigh, was at Essex Assize at Chelmsford on Tuesday sentenced to three years imprisonment for bigamy while at Southend and obtaining a cheque for £50 by false pretences. Mr J.C.Llewellyn said the legal marriage was at Pontypool in February 1945, Davies having met his wife when he was serving in the Fleet Air Arm and she was on war work. Then in November 1949, he went through the bigamous marriage with Mrs Patricia Jean Gregg, whom he met at a dance. He told a lot of fairy stories about his background; one was that he was a major in the army in receipt of £20 a week. Mrs Gregg had just divorced her own husband, and Davies, quite untruthfully, told her that he had just divorced his wife. While at an hotel in Cardiff with the bigamous wife he got into difficulties and telegraphed the lawful wife asking her to pay the hotel bill. The false pretences charge related to a painting contract. Davies, it was stated, had served a sentence for false pretences. His father had used all his own savings to meet his debts and wished to have nothing more to do with him. Mrs Gregg, an attractive young woman, told the judge that she wished to have nothing more to do with Davies. So, if by any chance, you are approached by a 92-year-old secondhand car salesman by the name of Brynley George Davies, take care!